Oh, how I'm going to hell for that post title. The final vampire picture produced by Hammer Film Productions saw the studio going out with neither a bang nor a whimper, but a comic SPROING!!! noise. At least that is the sound it makes in my head, because wow is The Legend of the 7 Golden Vampires ever a weird little movie. Not just weird in the "final vampire picture produced by the legendarily hidebound Hammer Films" sense. This film could have come out at any point in cinema history and ended up just as strange and inexplicable as it did. Here's what I expect the logic looked like: the folks at Hammer knew that if they didn't do something immediate and drastic to win back audiences, their studio was essentially in its final stages of life. So they looked around at the state of world cinema circa 1973, and noticed that hey, those chop-socky action pictures from Asia seem to be doing pretty well with the people who used to like our gothic horror movies. Why don't we...? And thus was born one of the strangest cinematic hybrids of which I am personally aware, in which the supremely British Hammer filmmakers brought their mechanically refined Dracula franchise over to Hong Kong, where they introduced it to Shaw Brothers, and that company's (at the time) over-the-top cartoon violence and high-energy martial artistry (hint for the uninitiated: if you enjoyed any moment of Kill Bill, Vol. 1, you owe a debt of gratitude to Shaw Brothers). The finished product was unapologetically strange, but that strangeness gave it a kind of maniacal energy that resulted in a film too ludicrous to hate. The fact that 7 Golden Vampires is such a tripped-out hack job is no small part of what makes it the first honestly entertaining Hammer Dracula picture in many years. Coming along for the ride was Peter Cushing, making his last film with the company that made him a star; but for the first time, Dracula was not to be played by Christopher Lee. I do not know if the offer was advanced, and the actor was dumbfounded to find a script so idiotic that even he couldn't touch it, or if (I think this is more likely), that his absence was an intentional cost-saving measure, given that Dracula has just about the smallest amount of screentime he ever received in this film, and for half of that time he's disguised himself in the body of a Chinese man. Either way, this notable absence, plus the film's decidedly ambiguous continuity, leaves 7 Golden Vampires feeling more like a spin-off than a sequel, with nothing but Cushing and the name of the bloodsucker tying it to anything that Hammer had ever even dreamt about before. -and 1904, in Chung King (Man, that was abrupt - that cut was like a Chung King express. Or am I still in trouble for the pun in the title? ), where the local university is failing to enjoy a lecture about vampire mythology being given by one Professor Van Helsing (if you don't know who plays him by now, go back and re-read the last eight reviews in this series). Van Helsing gets very excited in retelling a legend about a Chinese farmer who once interrupted a secret ceremony in which seven decrepit old men, practically walking corpses, in gold masks, prepared to drink the blood drained from seven beautiful girls, overseen by a high priest who looks an awful lot like Kah. The farmer was able to grab the golden bat medallion from one of the seven, who started leaking steam before collapsing into dust, and the farmer was smart enough to put that medallion on a shrine to Buddha, while he was being chased by an army of zombies that Kah raised by banging on a gong. The Chinese university authorities, a rigidly rationalist lot, don't much appreciate a foreigner coming in and telling them about their grisly myths, and how they're all true, everyone, and they walk out on Van Helsing. Of course, we know better, so when a few expository scenes later, a young man named Hsi Ching (David Chiang) creeps into Van Helsing's home to tell the professor that not only is the myth true, Ching's own grandfather was that farmer, and the remaining six vampires still hold his ancestral village in a grip of terror and bloodshed. It doesn't take much work to convince Van Helsing to go a-hunting, and he brings along the characters we met in those expositional scenes I mentioned: Ching's six brothers, his sister Mai Kwei (Shih Szu), a lovely and very wealthy Swedish adventuress named Vanessa Buran (Julia Ege), and Van Helsing's callow son, Leyland (Robin Stewart). It's better than "Lorrimer", I suppose. The rest of the movie has one and only one concern: shuttle our rag-tag group of heroes from place to place where they meet either vampires or bandits, and the Hsi siblings make quick work out of whomever by means of their magical silver weapons. Or in Ching's case, fists. That are not silver, but can still kill a vampire when they go through its chest. I'm not as much an expert on 1970s Hong Kong cinema as I ought to be, but my sense is that most of the fight sequences in The Legend of the 7 Golden Vampires are poor by the standards of the day, though not abysmally so. At any rate, there's rarely a moment when the fighting doesn't look absolutely fake. Was that one of the appeals of '70s martial arts films? I don't recall. The best thing about the fight sequences is that Cushing actually gets to join in a little bit: nothing absurd, like that time Christopher Lee's head has composited onto a video game sprite in Star Wars: Episode III - Revenge of the Sith, only little things like smacking zombies in the face with burning tree branches, and in one scene, rolling through a motherfucking campfire, and you can obviously see Cushing's face throughout the shot, so there's no chance that it's a stunt double. Anyway, this all happens while Leyland bobs back and forth uselessly (he never once gets a scene where he can prove that he's got the Van Helsing fighting spirit, I'm surprised to say), making Cushing's Van Helsing look even more badass. This is all silly beyond words, but it's the kind of silly that's also incredible fun and awesome, especially if you are or once were or ever wanted to be a twelve-year-old boy. I cannot possibly defend 7 Golden Vampires as regards is script, which is both sloppy - if Dracula has been in Kah's body for 100 years, leading the Golden Vampires, then who is Van Helsing talking about when he mentions that one time he killed a Transylvanian arch-vampire? - and arbitrary - everything preceding the half-way point is mostly watching characters team up for no reason other than the film has chosen them to be our protagonists, while afterwards it's just one extended fight after another - nor can I defend Baker's direction, which constantly errs on the side of weird shutter tricks and no tension (incidentally, he oversaw the only two Hammer Dracula films in which vampires have any sort of relationship to bats - Scars of Dracula was the other). And the acting ranges from the heroic failures of Chiang and Shih to overcome the fact that their command of English isn't enough to help navigate Don Houghton's clunky lines, to Ege's inability to convincingly sell the accent she was born with. 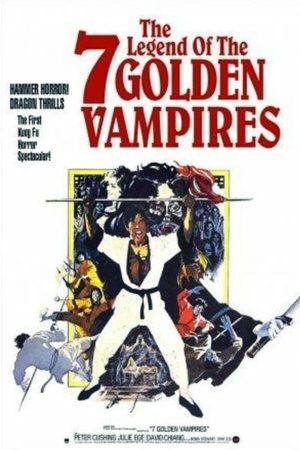 Frankly, 7 Golden Vampires is kind of awful like that. But dammit, I enjoyed myself, and I really enjoyed that Cushing was enjoying himself as well: especially in little tiny moments like when we catch him - or is it Van Helsing? - smiling a bit as he watches the Hsi family do their bloody thing on a gang of bandits, as Vanessa practically passes out next to him. The good doctor becomes something of a twelve-year-old boy himself in that instant, and that's really the whole tenor of his entire performance: well, that was a fun run of monster pictures, wasn't it? Watch me throw things at this guy in a skull mask! It's matinee trash, indensibly so, but it left me feeling reasonably satisfied, and if it took throwing away the last vestiges of sanity and propriety for a Hammer vampire film to make up for the disappointment the last few films left me with, well then, hooray for shallow trash.